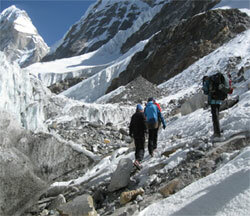 Kalinchowk Trek | Tseringma Treks & Expedition (P.) Ltd. Newly opened trekking trail, non-tourist area with the altitude of 3579m where you can see panoramic himalyan ranges and few monastries and temples. Inhabitants here inhabited by Tamangs, Sherpas and Brahmins.Annapurna, Lamjung, Manaslu, Ganesh Himal, Shisha Panga, Langtang, Dorjee Lakpa, Jugal Himal, Amabamori, Gauri Shanker, and Nambur Himal can be seen in this trek.Kali Temple is the most prominent temple for the hindus situated in Kalinchowk. Two natural springs originate from this area which are called Sundhara and Tama which are the main source of the very big two rivers the Sunkoshi and Tama Koshi rivers. The main flowers of Nepal Rhododendron (Laligurans) and the national bird Pheasant (Danfe) can also be seen in this area. Kalinchowk trekking ends at Charikot which is also a district head quarters then drive back to Kathmandu or possible to do continue the Sailung Trek.